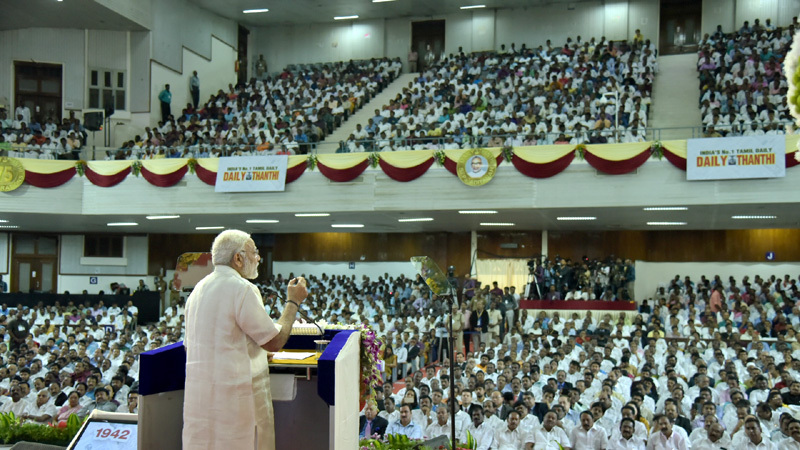 The Prime Minister, Shri Narendra Modi addressing the gathering on the occasion of the Platinum Jubilee of the Daily Thanthi, in Chennai on November 06, 2017. At the outset, I express my condolences and sympathies to the families of all those, who have lost their loved ones, or faced immense hardship in the recent incidents of heavy rain and floods in Chennai and other parts of Tamil Nadu. I have assured the State Government of all possible support. I also express grief at the passing away of senior journalist, Thiru R. Mohan. The Dina Thanthi has completed seventy five glorious years. I commend the contributions of Thiru S.P. Adithanar, Thiru S.T. Adithanar, and Thiru Balasubramanian ji, for the successful journey so far. Their stellar efforts over the last seven and a half decades, have made Thanthi one of the biggest media brands. Not just in the State of Tamil Nadu, but in the entire country. I also compliment the management and staff of the Thanthi group for this success. 24 hour news channels are now available to millions of Indians. Yet, for many, the day still begins with a cup of tea or coffee in one hand, and a newspaper in the other. I am told that the Dina Thanthi offers this option today, through seventeen editions, not only in Tamil Nadu but also in Bengaluru, Mumbai and even in Dubai. This remarkable expansion over seventy five years, is a tribute to the visionary leadership of Thiru S.P. Adithanar, who began this newspaper in 1942. Newsprint was a rare commodity in those days. But he began the newspaper by printing on paper made by hand, from straw. The font size, simple language and easy to understand narrative made Dina Thanthi popular among the people. In those times, it brought them political awareness and information. People used to throng the tea-shops to read this newspaper. Thus began the voyage, that continues till today, when its balanced coverage makes the Dina Thanthi popular, from a daily wage earner, to the highest political functionary in the State. I came to know that Thanthi means telegram. Dina Thanthi means “daily telegram”. Over the last seventy five years, the traditional telegram, delivered by the postal department, has become obsolete, and gone out of existence. But this telegram, continues to grow every day. Such is the power of a noble idea, backed by hard work and commitment. I am happy to learn that the Thanthi group has instituted awards for promoting Tamil Literature in the name of its founder Thiru Adithanar. I whole-heartedly congratulate the awardees: Thiru. Tamilanban, Dr. Irai Anbu and Thiru. V.G. Santhosham. I am sure, this recognition will be a motivating factor for those who have taken to writing as a noble profession. Mankind’s quest for knowledge is as old as our history itself. Journalism helps quench this thirst. Today, newspapers do not just give news. They can also mould our thinking and open a window to the world. In a broader context, media is a means of transforming society. That is why, we refer to the media, as the fourth pillar of democracy. I am fortunate today, to be among those who demonstrate the power of the pen, and show how it can be the vital life-force and conscience of society. During the dark days of colonialism, publications such as the Sambad Kaumudi of Raja Ram Mohan Roy, the Kesari of Lokmanya Tilak, and the Navjeevan of Mahatma Gandhi, lit a beacon, and inspired the freedom struggle. Across the country, there were pioneers in journalism, who often gave up a life of comfort. They helped create a mass consciousness and awakening, through their newspapers. Perhaps it is because of the high ideals of those founding pioneers, that so many newspapers established in the days of the British Raj, continue to flourish today. We must never forget that successive generations performed the duties required of them, towards society, and the nation. That is how we achieved freedom. After independence, the rights of citizens gained importance in public discourse. Unfortunately, over time we seem to have neglected our individual and collective sense of duty. This has in some way contributed to several ills that plague our society today. The need of the hour is to create a mass awakening towards “engaged, responsible, and aware citizens.” The civic sense of “entitlement” must be suitably balanced by a civic sense of “responsible engagement.” This should happen, of course, through our education system, and the conduct of our political leaders. But the media too, has a key role to play here. Many of the newspapers that shaped the discourse for freedom, were vernacular newspapers. In fact, the then British Government was fearful of the Indian Vernacular Press. It was to muzzle vernacular newspapers, that the Vernacular Press Act was enacted in 1878. In our diverse nation, the role of vernacular newspapers – newspapers published in regional languages – remains as important today, as it was then. They carry content in a language that is easily understood by people. Very often, they cater to vulnerable and socially disadvantaged groups. Their strength, their impact, and thus, their responsibility, can never be under-estimated. They are the messengers of the intent and policies of the Government, in far-flung areas. Equally, they are the torch-bearers of the thoughts, feelings and emotions of our people. In this context, it is indeed heartening to note that today, among our vibrant print media, some of the largest selling newspapers, are published in the regional languages. The Dina Thanthi, is of course, one among them. I have often heard people wonder, as to how the amount of news that happens in the world every day always just exactly fits the newspaper. Even though media may be owned by private individuals, it serves a public purpose. As scholars say, it is an instrument to produce reform through peace, rather than by force. Hence, it has as much social accountability as the elected government or the judiciary. And its conduct must be equally, above board. To recall the words of the great saint Thiruvalluvar, “There is nothing in this world except ethics, which would bring both reputation and wealth together”. Technology has brought about great change in the media. There was a time, when the headlines of the day, written on a village blackboard, carried immense credibility. Today, our media spans the entire range, from that village blackboard, to online bulletin boards. Just as education now focuses a lot more on learning outcomes, our attitude towards consumption of content has changed. Today, every citizen analyses, discusses, and attempts to cross-check and verify the news that comes to him, through multiple sources. Media, therefore, must make an extra effort, to maintain credibility. Healthy competition among credible media platforms is also good for the health of our democracy. Renewed emphasis on credibility, brings us to the subject of introspection. I firmly believe that reform in the media, whenever required, can only come from within, through introspection. Indeed, we have seen this process of introspection happen on some occasions, such as the analysis of the reportage of the 26/11 Mumbai terror attack. Perhaps, it should happen more often. I observe, that a lot of the media discourse today revolves around politics. It is only fair that politics be discussed at length, in a democracy. However, India is more than just us politicians. It is the 125 crore Indians, which make India what it is. I would be happy to see media focus a lot more, on their stories, and their achievements. In this endeavour, every citizen with a mobile phone is your ally. Citizen reporting can be an important tool in the sharing and dissemination of success stories of individuals. It can also be of immense help in directing relief and rescue efforts in times of crisis, or natural disasters. Let me also add, that during times of natural disasters, media usually does its best to cover various aspects of the incident. Natural calamities seem to be occurring with increasing frequency and intensity across the world. Climate change is a challenge for each one of us. Can media take a lead in the battle against it? Can media devote just a little space, or a fixed time daily, to report, discuss, or increase awareness about what we can do to combat climate change? I take this opportunity, to appreciate the media’s response to the Swachh Bharat Mission. As we strive to achieve Swachh Bharat by 2019, the 150th birth anniversary of Mahatma Gandhi, I am touched by the constructive role that media has played, both in generating awareness and mass consciousness towards cleanliness. They have also pointed out the work that remains to be done, before we can claim to have achieved our goal. There is another key area, where media can play an important role. This is the initiative of Ek Bharat, Shreshtha Bharat. Let me explain this with one example. Can a newspaper, devote just a few column inches of space, each day for one year, to this cause? Every day, they can write one simple sentence in their language of publication, along with its translation, and trans-literation, in all major Indian languages. At the end of the year, the readers of the newspaper will have been exposed to 365 such simple sentences, in all major Indian languages. Imagine the positive impact this simple step can create. Further, schools can be encouraged to discuss this in their classrooms daily for a few minutes, so that children too, are exposed to the strength and richness of our diversity. Hence, this step will not only serve a noble cause, but will also increase the strength of the publication itself. Seventy five years may be a considerable amount of time in a human life-span. But for a nation, or an institution, it marks just a significant milestone. About three months ago, we celebrated the 75th anniversary of the Quit India Movement. In a way, the journey of the Dina Thanthi, has mirrored the rise of India as a young, vibrant nation. Speaking in Parliament on that day, I gave a call for creating a New India by 2022. An India that is free from the evils of corruption, casteism, communalism, poverty, illiteracy, and disease. The next five years must be about Sankalp se Siddhi – accomplishment through resolve. Only then can we create the India of the dreams of our freedom fighters. As a newspaper that was born when the nation embraced the Quit India Movement, may I suggest that the Dina Thanthi has a special responsibility in this regard. I hope that you will use this opportunity, to reflect upon what you can do for your readers, or for the people of India, over the next five years. Even beyond the immediate target of five years, perhaps on the occasion of its platinum jubilee, the Thanthi must think of what the next seventy five years will be like. What is the best way to continue to remain relevant, and serve the people and the nation in the age of instant news at the fingertips. And in doing so, continue to maintain the highest standards of professionalism, ethics, and objectivity. In conclusion, I once again appreciate the efforts of the publishers of Dina Thanthi in the service of the people of Tamil Nadu. I am sure, they will continue to constructively help in shaping the destiny of our great nation. Next articleUnion HRD Minister Prakash Javadekar inaugurates ‘Chintan Shivir’.